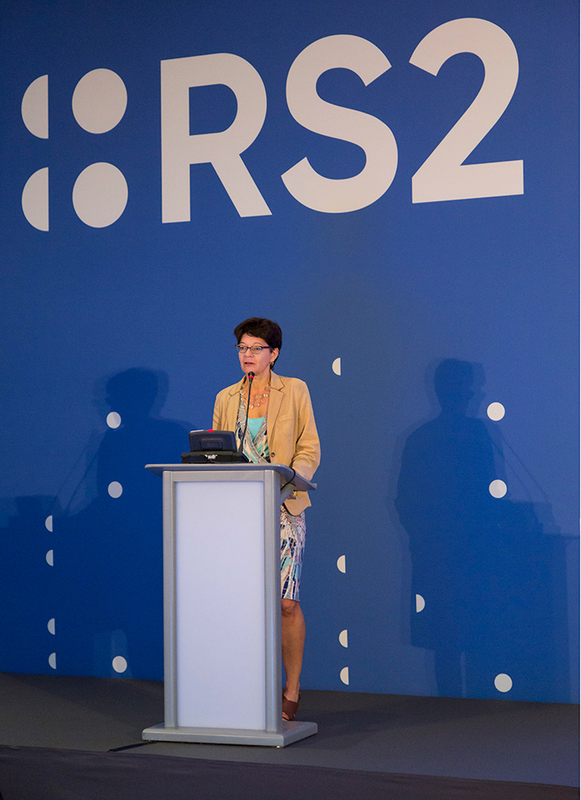 RS2 Software plc held its 10th Annual General Meeting last week and apart from the speeches by Chairman Mr Mario Schembri and the CEO Mr Radi El Haj, another two speakers addressed shareholders, namely Ms Daniela Mielke and Prof. Raša Karapandža. Both the Chairman as well as the CEO explained that following the successful change in the business model from one primarily focused on the sale of licences to managed services where the processing of transactions generates a recurring level of income, the next step for RS2 is to speed up the company’s expansion strategy in selected markets since there is evident demand for the company’s BankWorks product and transaction processing services. The senior executives informed shareholders that the company’s Board of Directors have agreed on an investment programme to recruit a number of internationally recognised industry specialists mainly in the areas of sales and business development in order to expedite the entry into selected geographic regions. The highlight of last week’s AGM was undoubtedly the intervention by Ms Daniela Mielke regarding the company’s ambitious plans for achieving a successful breakthrough in the North American market. RS2 had been earmarking penetration into the US market for several years following the company’s acquisition of a 26% stake in Transworks LLC in 2009 and the purchase of an additional 38.2% shareholding in 2014. Transworks was then renamed RS2 Software LLC and on 16 February 2018, a new company called RS2 Software Inc was formed in the US and was subsequently merged with RS2 Software LLC on 28 March 2018. Ms Mielke was recently appointed as CEO of RS2’s subsidiary in the US – RS2 Software Inc. This had been announced via the Malta Stock Exchange on 28 February 2018 and few shareholders may appreciate the vast experience in the field and the significance that a person of this high calibre agreed to join RS2. Ms Mielke was previously Chief Strategy and Product Officer at Vantiv (now WorldPay) which is the largest US merchant acquirer and also a client of RS2. Moreover, in the past, she also held senior positions with PayPal and VISA Inc. Ms Mielke explained to shareholders that her work in the past involved the repositioning of companies and developing innovation and growth initiatives. In her address to all shareholders last week, Ms Mielke touched upon three important aspects regarding RS2’s strategy for the US market. Firstly, she claimed that the North American market is by far the largest payment market in the world with the value of transactions already exceeding USD600 billion annually and which is growing at a significant pace. Secondly, she explained that despite the sheer size of the US market, there were only a handful of new entrants similar to RS2 who penetrated the market in recent years and created tremendous value for their shareholders. Ms Mielke mentioned PayPal, Stripe, Square and Adyen compared to the traditional players such as FirstData and WorldPay – the latter two incidentally are both existing clients of RS2. Many shareholders of RS2 may not be familiar with the names of most of the new entrants. However, it may be worth highlighting that Adyen made the international business headlines a few weeks ago following its hugely successful Initial Public Offering in the Netherlands when the company’s share price more than doubled on the first day of trading reaching a market capitalisation of over €12 billion. Ms Mielke then explained the plans for what she described as “RS2’s very distinctive entry strategy” for the US market. The strategy will revolve around providing outsourcing and acquiring services to Independent Sales Organisations (ISO’s), banks as well as merchants. Ms Mielke also explained that RS2 will not only be working with existing distribution channels that traditional players (such as FirstData and WorldPay) are using to compete with new entrants but they are also in the process of developing partnerships with leading financial-oriented players in the US market. Ms Mielke was visibly excited at the prospect of managing to penetrate the North American markets (the US and Canada) with RS2’s platform and expressed her optimism that “this will be a very exciting story for shareholders”. This is possibly as a result of RS2’s BankWorks platform which she described as being “very unique” with a high degree of flexibility allowing the company to address many different value propositions since it can be easily configured to meet various customer needs. Ms Mielke labelled RS2’s platform as a “very distinctive product” and she opined that its unique characteristics fit in well with the current trends in the payments industry. In order to better address the needs of the US market, other software modules within BankWorks are currently being implemented and RS2 is also in the process of obtaining certification from VISA and Mastercard before going live with the first client in the US. The 2017 Annual Report states that RS2 Software Inc is in “implementation mode for the provision of managed services for its first client in the US and in the process of securing further business”. Ms Mielke confirmed this at the AGM last week and indicated that the first client will start processing transactions in a limited capacity as from August 2018. In August 2015, John Elkins was appointed as a non-executive director of RS2 Software plc following a very successful career with First Data (a global leader in electronic payments with operations in 35 countries) as well as with VISA Inc. Moreover, in May 2017, Patrick Clarke was appointed as the Chief Technical Officer after a distinguished career as CEO and co-founder of a global acquirer processing company, which today is considered as a market leader in payment and processing solutions. These three important additions to the team at RS2 which will include several other industry specialists in the months ahead encapsulate the company’s vision to accelerate its regional expansion plans. Incidentally, the 2017 Annual Report discloses that over a period of 3 years, Ms Mielke will be allocated a shareholding in the US subsidiary which will dilute the company’s stake from 64.2% to 57.07%. This is a commendable initiative which could incentivise Ms Mielke to strive even harder to ensure that RS2 indeed succeeds in winning new business in the US. While the high level of conviction evident during the interventions at last week’s AGM on the ultimate potential of a successful entry into the North American market may not translate into an immediate positive impact on the company’s financial performance, RS2 has taken a bold move to accelerate its expansion strategy in selected markets which would hopefully create added shareholder value in future years. Meanwhile, the company needs to dedicate additional resources to communicating more regularly and effectively with its stakeholders to explain the progress being achieved in winning new managed services customers and how this will translate into an improved financial performance in future years.